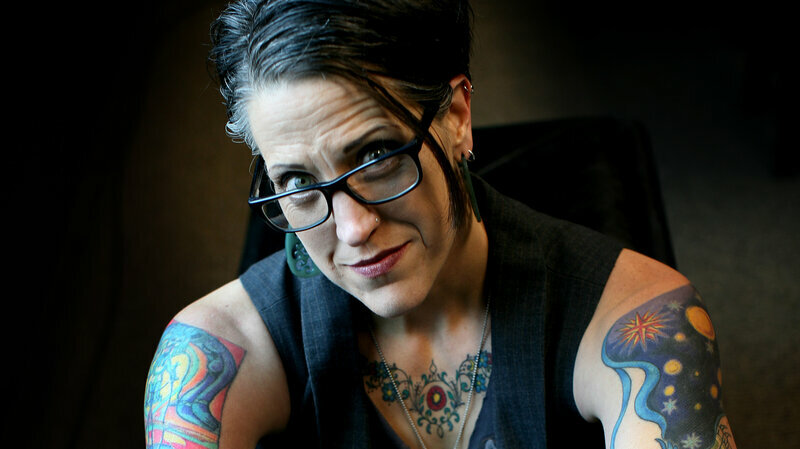 I really enjoyed an interview a few weeks ago with Nadia Bolz-Weber. She is a Lutheran Pastor who founded The House of All Saints and Sinners, and she prides herself on literally welcoming the outcasts to her church. These people include junkies, drag queens, and transgender. Here are some excerpts from the interview. How is she different that most other pastors? Other than the fact that I tend to swear like a truck driver? … I don’t look like a pastor, I’m very heavily tattooed, I have sleeve tattoos, basically, and very short hair, and I’m, like, 6-feet-1-inch [tall]. I don’t actually act like a pastor either. I don’t have that sweet, nurturing, “come to me; I’ll co-sign on all of your BS problems,” like, I just don’t have that warm, cozy personality, and I’m kind of cranky and a little bit sarcastic, I guess. Nobody ever meets me and guesses. The best thing is on airplanes. … Eventually if you talk to [people], which I try not to do, but if it has to happen, then they’ll say, “What do you do?” and I’ll invite them to guess, and never once have they guessed. I did get “burlesque dancer” once, which pleased me to no end. If you’re a middle-aged Lutheran pastor and someone guesses you’re a burlesque dancer, that feels like a win for the day. She was at a bit of a crisis when “normal” people started coming. That’s what is challenging to me about Christianity is that exact thing — being forced to look at your own stuff and being pushed into a space of grace that’s really, really uncomfortable. The unique thing about her church is that she doesn’t care what people believe, and even welcomes atheists! We have people who are atheist, agnostic, people who are very evangelical in their faith; somehow it’s a space where people who believe a lot of different things can come together, but that doesn’t mean I’m like a crypto-Unitarian. So I’m not just quoting Thich Nhat Hanh in my sermon; I mean, I’m actually a very orthodox Lutheran theologian, and it’s a very sort of Christo-centric community, but it’s one in which really everyone is welcome to come and participate. Furthermore, she doesn’t enforce any sort of morality either. I don’t monitor people’s behavior, let’s put it that way. So much of Christianity has become about monitoring behavior, and so far it has just failed to work as a strategy for making people better. For instance, we’re in the middle of this Ashley Madison scandal with all of these clergy, so on some level Christianity became about monitoring people’s behavior, like a sin-management program, and that almost always fails and often backfires. I would actually argue that conservative Christianity’s obsession with controlling sexuality — I mean absolute obsession with it — has in fact created more unhealthy sexual behavior than it has ever prevented. I really believe that. If you want to listen to the interview, go to NPR. It’s an interesting thought process here, welcoming the stranger. I heard a theology teacher say that Jesus “taught in bars.” He went to the sick, the outcast. In that way, I think that Bolz-Weber is following Christ’s example quite well. It’s exactly why the Pharisees didn’t like Jesus–he hung out with publicans, sinners, women, the poor…. Have we as a church lost the idea of “welcoming the stranger?” Not just someone you don’t know, but someone strange?